Get your message across or share your day with friends with Facebook stories. Facebook Stories are a great way of sharing pictures and videos with friends and followers on Facebook. They’re a great tool for social media storytelling, whether you’re posting for friends or followers. Apart from photos and videos, you can upload pre-made images into Facebook Stories. By using Canva, you’re sure to upload beautiful stories every single time. Our amazing design team has created different templates encompassing everything from quotes, greetings to announcements. At the same time, Canva’s drag and drop tools and amazing media library make transforming and personalizing each template a breeze. Create a new Facebook Story in 5 steps. Create a new Canva account to get started with your own Facebook Story posts. Customize your design in a few clicks. If you’re social media-savvy but not so great with design, never fear. With Canva, you’ll never have to design from scratch. 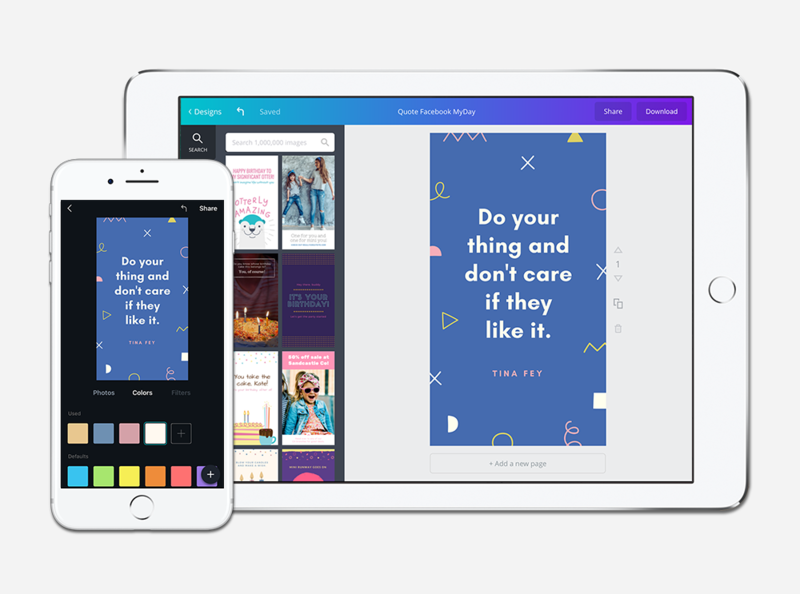 Canva is home to hundreds of ready-made, professional templates for Facebook Stories. Our designers have anticipated some of the most useful formats such as quote posts, announcement-type posts, or greeting posts. You can also always make your own design and just use the various elements, images, icons, shapes and text tools available in Canva. Thanks to Canva’s drag and drop simplicity and suite of intuitive design tools, you’re sure to end up with a great-looking design each time. Social media is primarily a visual platform so make sure to use eye-catching images for your post. By using Canva you also get access to an impressive media library with over a million images and illustrations to add to your design. To find a specific image, just head over to the search bar and type in a few keywords or go to the Elements tab and search through the various themed image folders. There are plenty of free images to choose from while premium images are priced at only $1 for each one-time use. Facebook Stories only last 24 hours and you can’t alter the order of images or videos in them once you’ve uploaded them. So, if you can, plan out the story, and create your images in advance. You can then add them in the order you’ve chosen, either all in one go, or throughout the day. That way, you could, for example build towards a big launch. You can create your Facebook Stories on your computer but you can always take and create your designs on the go with our iOS and Android apps you can download for free from the App Store or Google Play. They’re great for creating quick posts and sharing directly to your favorite social media platform. By creating your Facebook stories on the app, you can revise your design, post them directly to Facebook from your mobile device and create designs whenever and wherever inspiration strikes! There are watermarks on my Facebook Stories design; how can I remove them? How can I add branding to my design? If you’re handling social media for a business or organization, it’s important to ensure that all your posts are on-brand and easily recognizable. You can achieve this by uploading your logo, using your brand color palette and being consistent with fonts. To upload your logo, click on the Uploads tab in your object panel, select the Uploads folder, and click on the green Upload your own images button. Select any PNG, JPEG or SVG file you wish to upload from your computer. How can I format the text for my Facebook Story post?